The heroines of Black Mask’s Devil Within. It’s that magical time of year when we all indulge in the thrill of letting ourselves be spooked and alarmed by the things that go bump in the night and this week’s best new comics are all tailor-made to get at the heart of some of the things that scare us the most. A group of soon-to-be astronauts preparing to leave Earth’s atmosphere. For many people from Earth, making first contact with alien lifeforms would be understandable cause for alarm. But for Sasha Balodis, the hero of Aftershock Comics’ The Last Space Race from writer Peter Calloway and artists Alex Shibao and Nátalia Marques, it’s the best news in the world. Balodis is the kind of ridiculously rich technology tycoon who, after weathering a tragic personal loss, finds new purpose in life when he’s contacted by the U.S. government to participate in the country’s plans to rendezvous with the unidentified object that’s hurtling towards the Earth. Deva Karrell discovering that she’s been kept out of the loop. Even if we somehow manage to completely stop climate change from plunging our world into chaos and create sustainable societies designed to support the planet’s population, at some point the human species is most likely going to be wiped out along with everything else in the universe by way of heat death. Image Comics’ Infinite Dark—from writer Ryan Cady and artists Andrea Mutty and K. Michael Russell—imagines a future in which humanity, desperate to survive the impending second Big Bang, has managed to build The Orpheus, a ship capable of supporting life that’s meant to be the last place we can call home. While there are some 2,000 aboard the ship, billions of others are racing towards their salvation just as the rest of the universe is collapsing in on itself. Tragically, none of the other ships are able to escape the ever-encroaching void of space that snuffs out every single star and crushes every planet, and those aboard the Orpheus resign themselves to, well, being it. Michelle and Sam realizing that there might be something else lurking in their house. At some point in every new relationship, there comes a time when you end up telling your current significant other about the person you were with before. For some, that conversation comes relatively early on. 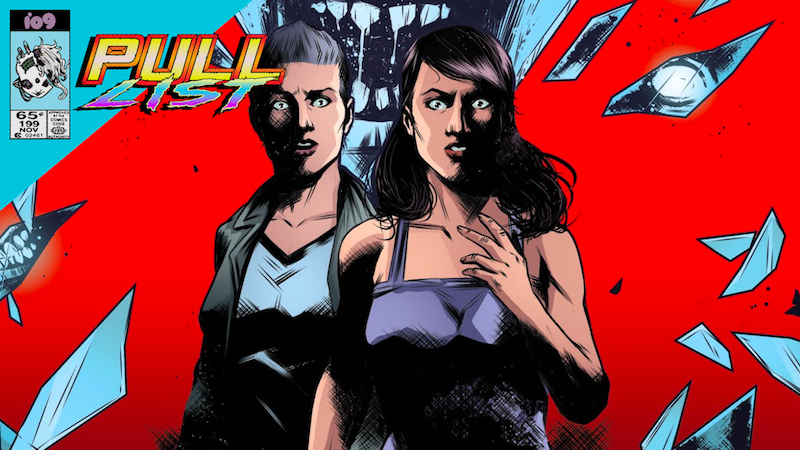 But for Michelle and Sam, the heroines of Black Mask Studios’ Devil Within—from writer Stephanie Phillips and artists Maan House and Dee Cunniffe—it comes a little later and rather unexpectedly. When Michelle is served with a restraining order by her ex-girlfriend Melody, she has to tell Sam about their brief fling that ended terribly.